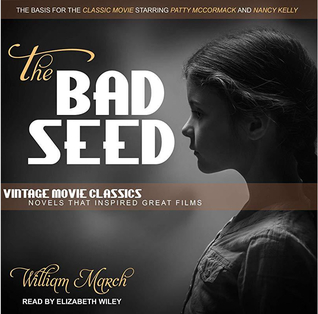 William March’s The Bad Seed is the perfect twisty thriller to curl up with this fall. It chronicles the story of Christine Penmark as she slowly realizes that her seemingly sweet little girl, Rhoda, is hiding very sinister and disturbing behavior. I loved this book much more than I expected to. It works perfectly in the time period it is set in. Christine is really trying to be the perfect 1950s housewife and Rhoda seems to channel the innocence and perfection of “Leave It to Beaver” or Shirley Temple. It was all the more horrific to find out that this tense façade of perfection was a lie, that the perfect Shirley Temple- like girl was actually a cold blooded sociopath. There's something special about eight-year-old Rhoda Penmark. With her carefully plaited hair and her sweet cotton dresses, she's the very picture of old-fashioned innocence. But when their neighborhood suffers a series of terrible accidents, her mother begins to wonder: Why do bad things seem to happen when little Rhoda is around? Originally published in 1954, William March's final novel was an instant bestseller and National Book Award finalist before it was adapted for the stage and made into a 1956 film. The Bad Seed is an indelible portrait of an evil that wears an innocent face, one which still resonates in popular culture today.